“I'm mad,” Gay Mullins told the reporter from The Washington Post. “This makes me angry. I'm angry, and I'm mad. I feel injured. Betrayed. Like a sacred trust has been violated ... People are having anxiety headaches. They've been placed in a distressed state." In 1985, scientists had discovered a hole in the ozone layer. TWA Flight 847 had been hijacked. But Mullins, a 57-year-old retired medical researcher from Seattle, had other concerns. He was speaking to the press about his outrage over the putrid, “soapy,” fizz-less mess he had recently made a show of pouring down a sewer drain. 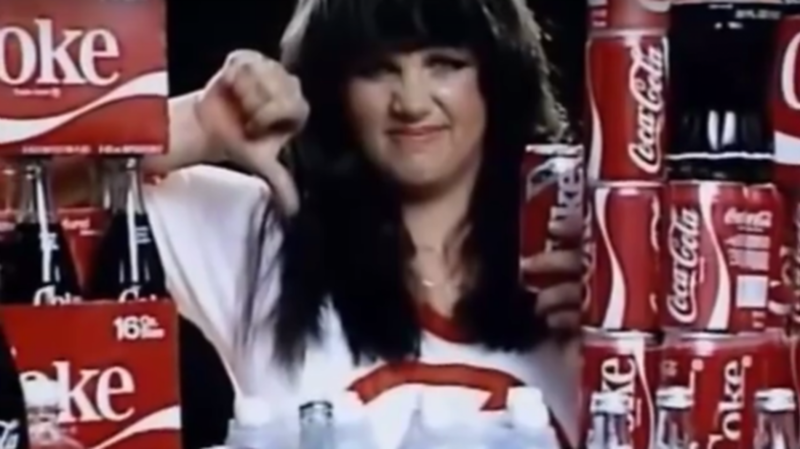 That April, the Coca-Cola Company had committed what would be one of the bigger consumer product blunders in modern times. Fearing rival Pepsi was encroaching on their market share, Coca-Cola tinkered with the recipe they had stuck to for the previous 99 years. The result, New Coke, was alleged to be a hit in research markets, with less of an acidic bite and more of a sweet, syrupy flavor—more like Pepsi. Coke was certain their refined taste would lead to a dramatic increase in the liquid-sugar market share. They were wrong. Fans revolted, stockpiling original Coke and selling it at a markup. Thousands of calls and letters flooded the company’s Atlanta headquarters. Company spokespeople tried damage control in the press, their flop sweat practically staining newspaper pages. People listened. Coke executives chewed their nails. Who was Gay Mullins? And was he really that serious about soda? Gay Mullins was born in 1928, making him just old enough to experience the clean-up efforts following World War II. After the conflict ended, he was stationed in the Caribbean and was fond of sipping rum and Cokes in his downtime. Some 40 years later, Mullins stepped away from work full-time, though he still dabbled in real estate. Sitting in a Seattle restaurant in late May 1985, Mullins and some of his friends began discussing the public relations disaster that was New Coke. Why, Mullins wondered, didn’t someone make a concentrated effort to unify the voices of all of the company’s angered customers? New Coke had been conceived the year prior, when Coca-Cola began to experience a degree of paranoia about their status as the world’s top soft drink. In 1972, 18 percent of soda drinkers said they preferred Coca-Cola, with just 4 percent opting for Pepsi. By the early 1980s, that had receded dramatically: Pepsi now had an 11 percent approval rating, with Coke barely ahead at 12 percent. Sensing that palates might have evolved to prefer Pepsi’s sweeter taste, Coca-Cola chemists toyed with a formula that delivered less of a fizzy bite. Testing in regional markets was highly encouraging: New Coke was preferred by a substantial margin. With $4 million sunk into development costs, Coca-Cola launched New Coke in April 1985. The backlash was swift. New Coke wasn’t a peripheral product, but a replacement for what would come to be known as “Classic” Coke, inciting a burst of negative feedback. Consumers had an emotional investment in the drink. A woman in Marietta, Georgia swung her umbrella at a driver stocking cases of the new flavor, yelling that it “tastes like sh*t.” Coke’s headquarters received upwards of 1500 calls a day, up from the usual 400, with virtually all of them complaining about the change. Coca-Cola CEO Roberto Goizueta received a letter addressed to the “Chief Dodo” of the company. At this point, Mullins decided to enter the fray in a very high-profile manner. Having tasted and rejected New Coke, he used his retirement fund to form a coalition, the Old Soda Drinkers of America, and set up a bank of 900-number telephone lines in a Seattle office. For $5, anti-New Coke activists would receive newsletters, bumper stickers (“Coke Was It”), pins, and plans to hold rallies in their local areas. In Atlanta, picketers held up signs (“My Children Will Never Know Real Refreshment”). Armed with hyperbole, Mullins quickly became a media favorite. Surrounded by his banks of telephones that cost $10,000 a week to maintain, he railed against the corporate blunder and vowed to do whatever it took to return Coke Classic to store shelves. Rather than try to catch the odd disgruntled consumer on the street, television became addicted to Mullins, turning to him for sound bites. He was even scheduled to debate Coke executives on ABC’s Good Morning America, but the appearance was canceled. Mullins insisted Coke was running scared. The company shied away from commenting on him in the press, with a spokesperson saying they “don’t pay much attention” to the anti-New Coke movement. But what Mullins did next would force a response. In June 1985, the same month Pepsi gleefully announced a 14 percent spike in overall product sales, Mullins filed a class action lawsuit against the Coca-Cola Company in U.S. district court. Citing Fair Trade Commission rules about misleading product advertising, Mullins called for Coca-Cola to be restrained from packaging New Coke into Coke Classic cans. Mullins insisted they either comply or turn over the highly-guarded recipe so “someone else” could make the drink. The new stuff, he wrote in his complaint, tasted like Pepsi, which was an unforgivable slight. Federal judge Walter McGovern tossed the complaint out in less than a week. “I like the taste of Pepsi,” he said. It didn’t matter. On July 10, Coca-Cola finally capitulated, with Peter Jennings interrupting an ABC daytime soap to announce that the company would be bringing back its original drink. New Coke wouldn't disappear—at least, not immediately—but consumers could have a choice. Mullins was elated. Though he had spent roughly $100,000 drumming up support for the cause, he said it was worth it to prove that consumers had a voice. In their first sensible marketing decision of the year, Coca-Cola decided to capitalize on Mullins’s advocacy by promising to send him the first new case of “old” Coke that rolled out of their Atlanta plant. In front of press, Mullins downed a can, then doused himself over the head with the rest. The 79-day drought was over. Shortly after, Mullins reached out to Coca-Cola executives. He would be happy to continue his brand ambassadorship, he wrote, for a fee of $200,000 per public appearance. It turned out that Mullins and his friends had concocted more of a business idea in that restaurant than a consumer advocacy group. According to Mullins, he figured Coca-Cola might pay him as much as $50,000 to shut up and perhaps more than that once the smoke cleared and he had made a name for himself. He also offered his services to Pepsi. Both companies declined his advances. Mullins receded from the spotlight, leaving Coke to resume its status as the industry’s leading soft drink. Despite their blunder, Pepsi never charged ahead to claim the top spot. While the company may have been slightly taken aback by Mullins’ offer, there was early evidence he might not have been as emotionally involved as he claimed. During the height of New Coke hysteria, The Seattle Times invited him to take a blind taste test. In six tries, Mullins failed to distinguish New Coke from Coke Classic. In at least one attempt, he sipped from a can of Royal Crown Cola and claimed it was authentic Coke. Despite his activism, he never once identified the real thing.